A dipole and inverted V dipole calculator. Enter the frequency in Mhz and hit calculate to get the resulting lengths of the complete dipole and each leg, both for the normal dipole and the inverted V type. 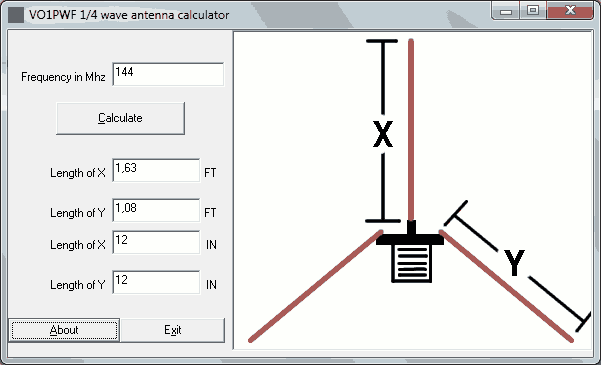 Another little application written to help aid in vertical antenna construction. Enter the frequency in MHz and click calculate it will give you the length for the radiating element as well as the ground plane elements. Ideally for radials you should have them sloped downward at a 45 degree angle to help provide a better match. As with all gambas programs they need the gambas runtime to work witch is a simple install from any major distribution. But the coil to ground derivation, how is calculate?